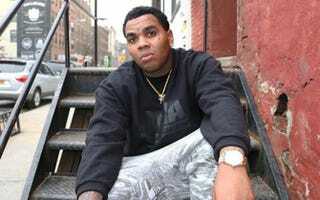 On Friday, 18-year-old Miranda Dixon saved up her hard-earned money in order to stand in attendance at a Kevin Gates concert held at Club Rumor in Lakeland, Fla.
During the show, Dixon reached out to touch Gates. When her first attempt failed, she tried again. But then Gates kicked her in the chest, authorities say. The incident was caught on video and uploaded to WorldStar and has garnered over a million views. The Lakeland Police Department has now charged Gates with simple battery, but Dixon still hasn’t recovered from her injuries. “It still hurts so much; that is why I try not to talk too much or even walk around,” Dixon said of the injuries she received. Dixon also plans to press charges against Gates.